From the Last Lecture department... Thanks to Andy for the heads up! 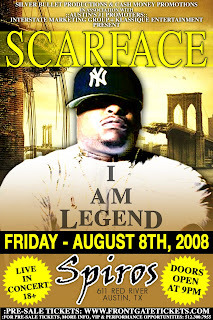 Scarface @ Spiro's on August 8th! Tix are $15 and you can get them here. I'm a computer scientist / software developer, so the passing of Randy Pausch really hits home. Randy Pausch is a computer science professor at Carnegie Mellon, who was diagnosed with pancreatic cancer. He is very inspirational and everyone should definitely watch The Last Lecture on YouTube. Brad Jordan (born in New Jersey), better known by his stage name Scarface (and formerly Akshen) is an American rapper originally known for his work as a member of The Geto Boys. He has been a solo artist since 1991, becoming one of the most popular southern rappers in the business, while maintaining ties to The Geto Boys. Scarface began his career as Akshen (pronounced Action) recording solo for Lil' Troy's Short Stop Records, a local label in Houston. He would go on to sign with Rap-A-Lot Records and join a group who were collectively known as Ghetto Boys replacing one member who left, later respelled Geto Boys, and released Grip It! On That Other Level (1989), a highly successful LP that garnered the group a large fanbase, in spite of their violent lyrics keeping them far from radio and MTV. Akshen changed his name to Scarface (he also changed his flow from a rapid-fire Kool G Rap-like delivery to normal flow, this time with a darker tone), after the film Scarface, saying he felt that the main character of the movie was like him in many ways. He then released his debut solo album, Mr. Scarface Is Back. The album was a success, and Scarface's popularity soon overshadowed the other Geto Boys. Scarface remained in the group while releasing a series of solo albums that kept him in the public view with increasing sales. This peaked with 2000s The Last of a Dying Breed, which received overwhelmingly positive reviews and sales, and earned him Lyricist of the Year at the 2001 Source Awards.